Over the past few months, we’ve collaborated with several local businesses to host pop-up shops in order to achieve our goal of providing residents with an activated lobby space and overall sense of community. Two of our most successful pop-up events were with local retailers Arrow Clothing and Mint + Major. Let’s take a look at these brands and how they helped residents live their Anthem. Do You Have What it Takes to Pop? Both Arrow Clothing and Mint + Major have brands that align with our own—we all believe in creating an uplifting, collaborative, and supportive community. Owners Amanda Valderas (Arrow Clothing) and Melissa Bona (Mint + Major) agreed that Anthem House was an ideal venue to host their pop-up events. “My favorite thing about having our pop-ups at Anthem House is the lobby space! It’s such a gorgeous space and there are so many different areas to host a pop-up,” stated Valderas. Bona added, “My favorite thing about our pop ups have been how supportive the Anthem House staff is, how they are always willing to help if needed.” With the Anthem’s location being convenient to 95 and the lobby space being connected to Amber Café, it’s an ideal location to host pop-up events. Behind the Brands We sat down with the owners for a Q&A session to dive into what makes their brands so unique. What's the significance behind your name? Amanda: Arrow Clothing was given its name long before it was a reality. Life’s challenges and struggles are what really pushed me to follow my passion of owning my own clothing boutique. A quote that helped me get through those challenges from a young age was “An arrow can only be shot by pulling it backward. When life is dragging you back with difficulties it means it’s going to launch you into something great. So just focus and keep aiming.” I knew I wasn’t the only one in the world going through struggles in life. The everyday woman goes through struggles and I want our customers to always feel empowered, supported and uplifted when they shop with Arrow Clothing because of that. Melissa: Mint + Major is a take on a few things. In my old world of buying, we would always use the term Fresh when describing something new. We would say is this fresh? Is this cool? And I actually had an obsession with Mint when that color was popular a few years back, so much so that my friends and I would joke that I needed a “mintervention.” I also wanted the brand to be fast, forward adopting trends early so that’s where Major came from. I actually had help from a few friends on a road trip to Outer Banks, North Carolina. We had hours in the car, so we mashed up every combination you can think of and ended up with Mint + Major. I was like that’s it! How did you get started? Amanda: Arrow Clothing was a dream of mine since I was a little girl. I always loved styling people I knew, especially my mom when we would shop together. In 2016, I started a fashion and lifestyle blog to share my love of fashion and bring affordable styles to women on a budget. Shortly after launching my blog, I realized that instead of pointing women in the direction of affordable trendy styles, I wanted to be the one to provide the everyday woman with chic, contemporary, quality fashion trends at an affordable price! With the help and unwavering support of my amazing husband Joe, who many of our customers get to meet at our events, in December 2017, I finally launched my passion, Arrow Clothing and it’s been the most surreal and rewarding experience of my life. Melissa: I was working for years as a buyer for top retailers, and my love for buying never changed, but my vison for what I wanted my life to be like did. I was determined to create a retail environment that was fun and empowering where collaboration is important. I quit my corporate job in August 2017 and spent the next few months developing Mint + Major. A lot of the idea of what the company would be came to me while I was in Honduras building houses for families that really needed the support and help. I was on a bus heading to the mission house and it took 3 hours more than it was supposed to take to get there because of the conditions of the roads. In those extra hours, Mint + Major was really developed. I believe it was a God thing. When you help others I truly believe that you are rewarded. When I arrived back home I spent from September-December 2017 building the website, buying product for our January 2018 Launch! How would you describe your personal style? Amanda: I would describe my personal style as natural and effortless. I joke a lot of the time with my girl friends that I spend the least amount of time styling myself because I literally LIVE to style others and make others look and feel their best! I am also a huge creature of habit, so you’ll usually catch me in the same booties or shoes that I’m loving at that point in time, always a jean with some stretch and a cute, easy top! Melissa: My personal style is “All Black Everything” I will occasionally wear color but you will always catch me in black + white. I love leather, ripped denim, and statement accessories. I always want to be comfortable and effortless. In your opinion, what's your #1 must have product? Amanda: In my opinion, every woman needs a tried and true pair of jeans that will never let her down! Some stretch, but not too much for the perfect, comfy fit. 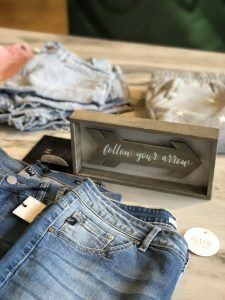 A good pair of jeans will never go out of style and two brands that we carry, I swear by! All the stretch and shape you need in a ride or die pair of jeans! Melissa: In the beauty, you must have a cleansing oil. Our One Love Organics Vitamin B Cleansing Oil has done wonders for my customers skin. It has the ability to take off your make up and cleanse at the same time. What's your top selling product? Amanda: Our top selling product has been our Margot Waffle Knit Sweater. Everyone has been living for this sweater, Melissa with Mint + Major bought one for herself and wore it to our last pop-up together! The colors are so perfect for this time of year! Melissa: We do so well with our French Girl Rose Lip Scrub. It is an item we will always carry because our customers love it so much! What was your favorite thing about the pop-up boutique at Anthem House? Amanda: My favorite thing about having our pop-ups at Anthem House is the lobby space! It’s such a gorgeous space and there are so many different areas to host a pop-up.  With the lobby being connected to Amber Café it also provides those attending the events the opportunity to pop in Amber for a coffee and bagel on their way in or beer and burger on their way out. The location of Anthem House has been great for us as well with it being convenient for those living in the city or the county with its close proximity to I-95. Melissa: My favorite thing about our pop ups have been how supportive the Anthem House staff is, how they are always willing to help if needed. The space allows for so much creativity, and when you are popping up an entire store in a few hours it is important that where you do it wants you to be successful and I always feel that from everyone at the Anthem House. 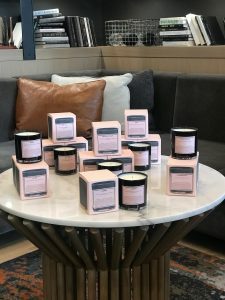 How did the pop-up boutique at Anthem House help elevate and/or spread awareness of your brand? Amanda: Our pop-ups at Anthem House have allowed us to connect with many more customers than what we currently reach. Many of the residents at Anthem House or people that live nearby are within our demographic, so being able to be right where they are and literally bring the latest trends and styles to their front door (or lobby should say!) was absolutely amazing for us and we have gained so many more loyal customers from this awesome partnership with Anthem House! Melissa: Our Beauty Is the New Black Event was amazing and really put us on the map in the blogger community, not only did we have the amazing Sydney from Coffestainedlace but so many influencers attended and had a great time. They not only bought things they really loved but also reposted and shared with in their community. It was better than we could have ever expected! What advice would you give to other brands looking to host a pop-up boutique at Anthem House? Amanda: The advice I would give to other brands looking to host pop-ups at Anthem House, other than absolutely having a pop-up there, would be that if it’s your first pop-up, look to collaborate with other brands. Collaboration is the future and collaborating with brands that are in sync with yours and complement each other will give you even more reach for new customers that might not have found you on their own. 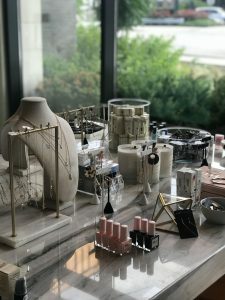 One of our other pop-ups at Anthem House was a collaboration with Amber Café and a Stella + Dot stylist who is an Anthem House resident and heard about us from our previous pop-up. It was so fun working with both Gino at Amber Café and our friend Kara, the Stella + Dot stylist and we put on such a fun evening event! And one last piece of advice: don’t forget to think of ways to give back to your awesome customers! Having a giveaway or complimentary drinks and small bites are always a hit and really brings a lot of excitement for your upcoming events! What advice would you give to other brands looking to host a pop-up boutique at Anthem House? I would advise them to go for it! The venue is the perfect Space to create any event you want to dream up! We have done two there already and look forward to more to come! 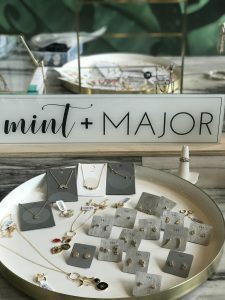 Now that we know more about these entrepreneurial young women and their brands, here’s where you can find them next: Girlsgiving - 11/24 | 11am – 3pm Arrow Clothing, Mint + Major and Thurman + Fig will join forces for an event hosted by Vanessa Ulrich, aka @ThePrimpySheep, at The Charles Baltimore. Arrow Clothing Arrow’s 1st Birthday – 12/8 | 7pm – 10pm Join arrow clothing in celebrating their first birthday at the Waterfront Hotel Bar. Mint + Major Ugly Sweater Party – 12/1 Stay tuned for details on this gift giving event with a local blogger! Kennilworth Mall Pop-up – 12/6 Pop-in Event – 12/14-16 Broactos Hair Studio Pop-up – 12/21 Do you want to Pop? If you’re interested in hosting a Pop-up shop at Anthem House, contact our Property Manager, Amy Nelson.